Lipoproteins are macromolecular assemblies composed of lipids and proteins at variable ratios, densities and sizes. Their role is to transport water-insoluble lipids in the blood. On the basis of their buoyant density lipoproteins are divided into 5 major classes: chylomicrons, very low density lipoproteins (VLDL), intermediate density lipoproteins (IDL), low density lipoproteins (LDL) and high density lipoproteins (HDL). LDL and HDL are known as the “bad” and “good” cholesterol, respectively. Thus, elevated levels of LDL are linked to premature development of atherosclerosis and coronary heart disease, while high levels of HDL appear to be protective. Members in this group study various aspects of lipoprotein metabolism using both physical techniques, (X-ray crystallography, NMR, circular dichroism, calorimetry, and cryoelectron microscopy), biochemical, cell and molecular biological techniques to provide a detailed characterization of the mechanisms underlying the pathogenesis of this widespread, life-threatening disease. Our research focuses on the molecular details of the structure, stability and dynamic properties of the plasma lipoproteins and their constituent apolipoproteins, particularly high density (HDL) and low density (LDL) lipoprotein. This information is vital to an understanding of lipid-lipid and lipid-apolipoprotein interactions, apolipoprotein exchange, lipoprotein cell surface interactions, receptor-mediated lipoprotein uptake, and lipoprotein inter-conversions that form the basis of lipid transport and metabolism. Conformational adaptability of the exchangeable apoproteins (apoA-I) is essential to both their structural role in lipoprotein stabilization and their functional roles as cofactors for enzymes, ligands for receptors, or mediators of reverse cholesterol transport. The precise molecular mechanisms underlying this unique structural adaptability remain unclear. A detailed understanding of apolipoprotein conformation, stability and adaptability is vital to further progress in understanding lipoprotein structure and function. Using state-of-the-art methods of molecular biophysics and structural biology, we focus on structural and thermodynamic investigations of specific lipoproteins (HDL and LDL), apolipoproteins, and peptides that model apolipoprotein structural domains. Improved definition of the structure of plasma lipoproteins will lead to an understanding of factors important in normal lipoprotein metabolism, tissue and cellular uptake and regulation of lipid metabolism and the pathogenesis of atherosclerosis. The long-term goal of our work is to determine in molecular detail the energetics-structure-function relationship in exchangeable apolipoproteins and lipoproteins. Exchangeable apolipoproteins are water-soluble protein components of lipoproteins that mediate lipid and cholesterol transport and metabolism and play crucial roles in the pathogenesis of atherosclerosis, stroke and other human disorders. Structural stability and compositional variability of apolipoproteins are essential for their functions, and have to be understood in detail in order to elucidate molecular mechanisms of lipoprotein action. Our work addresses this long-term goal through detailed studies of the thermodynamics, kinetics, structure, and lipid binding function of plasma apolipo-proteins, such as human apoC-1 (57 amino acids). 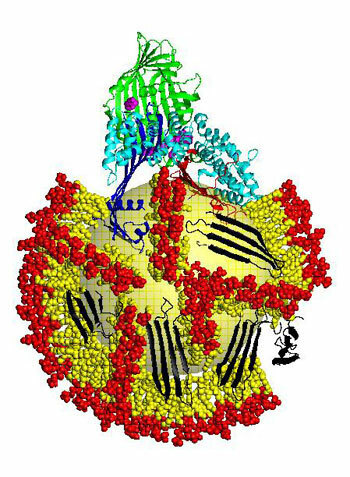 Energetic and structural analyses of lipid-free and lipid-bound human apoC-1 and a series of its point mutants targeted towards specific structural regions is carried out in our laboratory by using a combination of far- and near-UV circular dichroism and fluorescence spectroscopy, electron microscopy, differential scanning calorimetry, and x-ray diffraction methods. Such analysis will ·determine, at the level of individual amino acids, the roles of key structural elements in apoC-1 for its folding, stability, and lipid binding properties; ·identify critical determinants for the lipoprotein stability and their relation to the kinetics of apolipoprotein transfer among lipoproteins in the course of their metabolism; ·crystallize apoC-1 and analyze its structure by x-ray diffraction. The results will provide the energetic and structural basis for understanding molecular mechanisms of lipoprotein action in normal and diseased state. Our laboratory focuses on the mechanisms that regulate the assembly and secretion of very low density lipoproteins (VLDL), the precursors of low density lipoproteins (LDL) which play an important role in the pathogenesis of heart disease and stroke. The assembly of VLDL is initiated by apolipoprotein B, a very large glycoprotein with a unique capacity to recruit large amounts of triacylglycerols (TAG). By utilizing biochemical, cell and molecular biological methods we have characterized the ability of N-terminal domains of apoB (expressed by transfected cells that do not normally secrete lipoproteins) to bind phospholipids and TAG to form lipoproteins. Thus, while the N-terminal 17% (apoB-17) recruits very little lipids, and is secreted primarily lipid-poor, the N-terminal 41% (apoB-41) is assembled into TAG-rich lipoproteins. Nonetheless, apoB-17 has the capacity to bind phospholipids to form lipid-rich particles in vitro. Furthermore, it binds tightly and irreversibly to emulsions modeling TAG-rich lipoproteins. Understanding the molecular details of the assembly of apoB into VLDL will ultimately allow us to devise means to modulate the level of secreted VLDL, thereby reducing the risk of heart disease and stroke. The McKnight laboratory is interested in the structure and function and folding of a variety of proteins including Apolipoprotein B (ApoB), the protein component of low density lipoprotein (LDL). LDL is the “bad cholesterol” transporter, and clinically, elevated levels of LDL are associated with atherosclerosis. We use a combination of biophysical, molecular biological, and computational methods to investigate and model the N-terminal region of this very large protein. Our long term goal is to understand and develop drugs that modulate the secretion of the precursors of LDL. 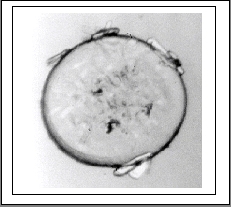 A model of a lipoprotein particle formed with the N-terminal 41% of ApoB. The ApoB protein is shown in ribbons, surface phospholipids are shown in space-filling representation, and the triglyceride/cholesterol ester core is shown as a yellow sphere. Our research concentrates on structural studies of membrane receptors, such as the low-density lipoprotein (LDL) receptor. Our studies have focused on the full-length LDL receptor, with the transmembrane domains in either detergent-solubilized or vesicle-reconstituted forms. These studies have led to low-resolution descriptions of the LDL receptor. Future studies are directed mainly towards improved higher resolution structural descriptions of the extracellular ligand-binding domains of the receptors and their interactions with LDL. Constructs of the extracellular domain of the LDL receptor will facilitate both our structural studies of the receptor and the analysis of the LDL-receptor interactions. Our research is directed towards: (1) using gold-labeled LDL receptor and LDL receptor extracellular domains, to localize the receptor-binding domain of apoB on LDL using cryoelectron microscopy / single particle methods; (2) to engineer a C-terminal cysteine residue on expressed extracellular domains of the LDL receptor; (3) to use the C-terminal cysteine to bind extracellular domains of the LDL receptor either directly to maleimide-lipid monolayer surfaces or indirectly to lipid monolayers following acylation / alkylation of the cysteine residue; (4) to perform structural studies of oriented LDL receptor and 2-D arrays by electron microscopy; (5) to use oriented extracellular domains to bind and orient LDL for structural studies by electron microscopy; (6) using CD spectroscopy, scanning and titration calorimetry, to define the secondary structure, conformation and unfolding of the human LDL receptor and its expressed extracellular sub-domains.